One World Hotel Petaling Jaya is dedicated to the green environmental protection since its opening and has been awarded the Best Eco-Friendly Hotel (in the Country level) for it’s outstanding endeavours to protect and to improve the environment at the Haute Grandeur Global Hotel Awards Gala Ceremony in Abu Dhabi last year. 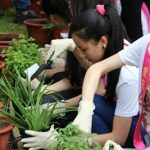 Synonymous with the organisation’s effort to be an environmentally friendly hotel, an herb gardening activity with the contestants of Miss Chinese World 2017 was organised recently. The event was led by Feryal Mufti, Public Relations Manager with the objective to inspire the ladies from all walks of life and culture to come together and to create a more favourable environment to live in by educating them on the importance and benefits of greens, the actual planting and care of it. 31 participants from 10 countries worldwide, namely China, Thailand, Indonesia, Myanmar, Singapore, Taiwan, Vietnam, Laos, Cambodia and Malaysia gathered at the hotel’s garden at 9am. A demonstration was conducted by two team members of the housekeeping department and soon after, the beauties got their hands dirty and had great fun with spade, soil, pots and plants. The affair concluded an hour later with 31 gorgeous pots of flavourful herbs such as rosemary, thyme, oregano, basil, dill, mint, sage, parsley, aloe vera and more. The Miss Chinese World pageant was created to celebrate and to promote the Chinese culture, values and age-old tradition alive while bringing together beauties of Chinese ethnicity from all over the world to foster peace, goodwill and friendship. One World Hotel Petaling Jaya are one of the Platinum Sponsor for this pageant.